Notes and Nerds: The Teenage Mutant Ninja Turtles Are Back At Pizza Hut! The Teenage Mutant Ninja Turtles Are Back At Pizza Hut! Yes, that's right! 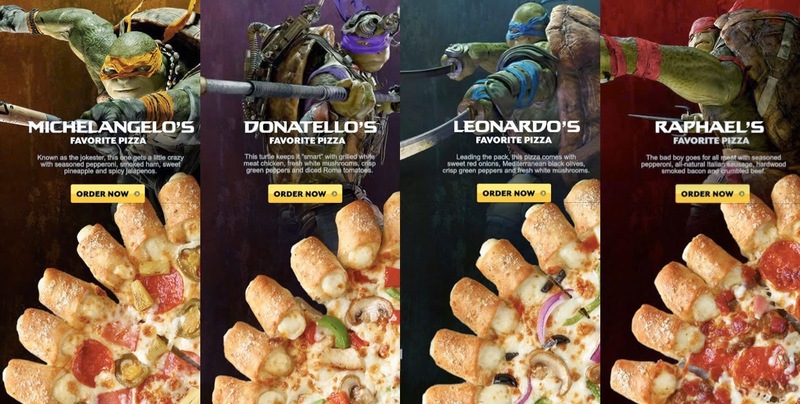 For the new Teenage Mutant Ninja Turtles movie, Pizza Hut is sponsoring the Ninja Turtles again. Back in 1990 Pizza Hut was the official sponsor of the Teenage Mutant Ninja Turtles for their Coming Outta Their Shells Tour. For $3.99 you received Teenage Mutant Ninja Turtles: Coming Outta Their Shells cassette, poster, concert tour book, and at certain Pizza Huts you could buy Teenage Mutant Ninja Turtles: Coming Outta Their Shells VHS for $9.99. Well 24 years later and the Ninja Turtles are back at Pizza Hut but with a different angle... Pizza. Yes, Ninja Turtles have their own kind of pizzas with cheese bites attached to the pizzas. It's something different, but could be very delicious. Cowabunga, dudes!